XUY, LIY, HUANGH. Investigation to the damage tolerance of composite cylinder for vehicles by numerical simulation[J]. Materials Science Forum, 2008, 575-578: 198-203. 郭崇志,甘平燕,付小立. 复合材料缠绕层缺陷深度对CNG-2气瓶强度影响的研究[J]. 压力容器, 2013, 30(3): 5-14. HUANGC H, LEE Y J. Experiments and simulation of the static contact crush of composite laminated plates[J]. Composite Structures, 2003, 61(3):265-270. HASHIN, Z, ROTEM, A. A Fatigue Failure Criterion for Fiber Reinforced Materials[J]. Journal of Composite Materials, 1973, 7(4):448-464. HASHINZ. Failure criteria for unidirectional fiber composites[J]. Journal of Applied Mechanics, 1980, 47(2):329-334. TSERPESK I, LABEASG, PAPANIKOSP, et al. Strength prediction of bolted joints in graphite/epoxy composite laminates [J]. Composites Part B: Engineering, 2002, 33(7): 521-529. ZHANGX,ZHAOJ P,WANGZW.Burst pressure prediction and structure reliability analysis of composite overwrapped cylinder[J].Applied composite Materials, 2017,25(1):1-17. Numerical simulation and theoretical analysis were performed to explore the mechanical behavior of filament wound cylinders with rectangular defects. 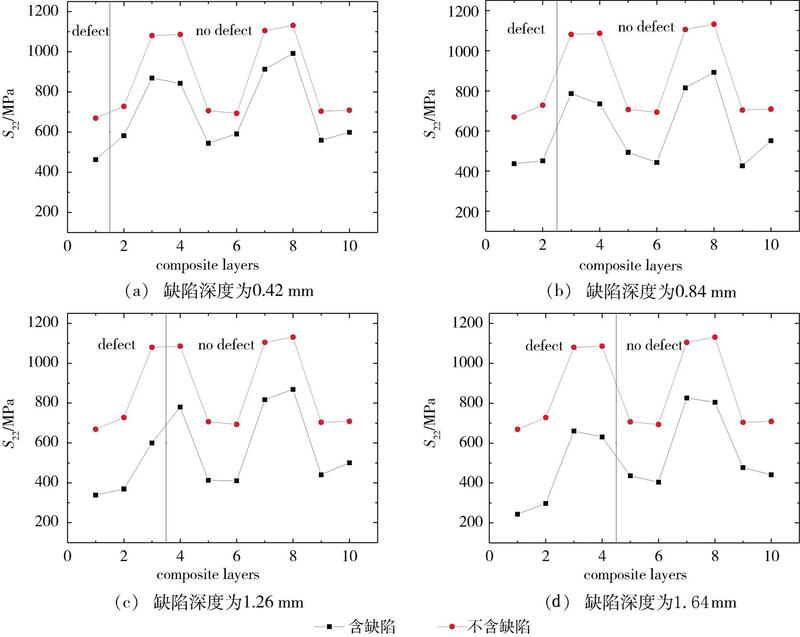 3D-Hashin failure criterion was applied to distinguish the damage modes and predict the damage initiation, and damage evolution laws with parameters degradation were used. The VUMAT subroutines which was compiled by FORTRAN was established for ABAQUS/Explicit FE code. Selecting the filament wound cylinder with ［90°2/18.9°2/90°2/28.9°2/90°2 ］winding order as the research object, the influence of defect depth on stress level was analyzed. 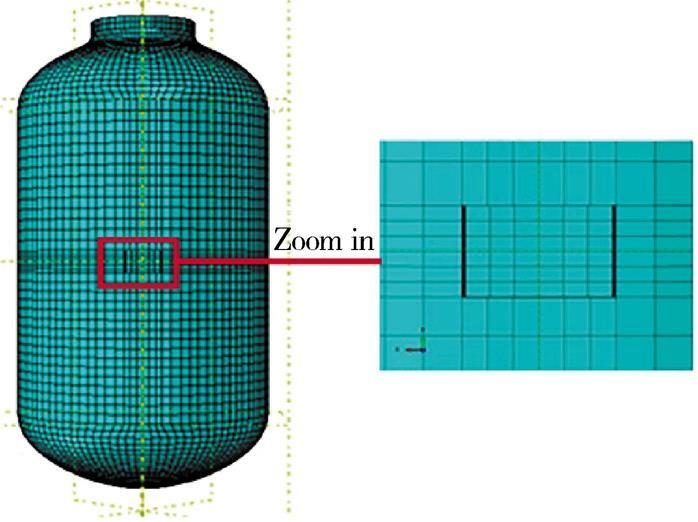 Based on the influence of the defect depth on the circumferential and axial stress of each layer, the calculation formula for the blasting pressure of the filament wound cylinders containing defects was proposed with the adoption of the correction method. The results of this formula are in agreement with the numerical simulation results. 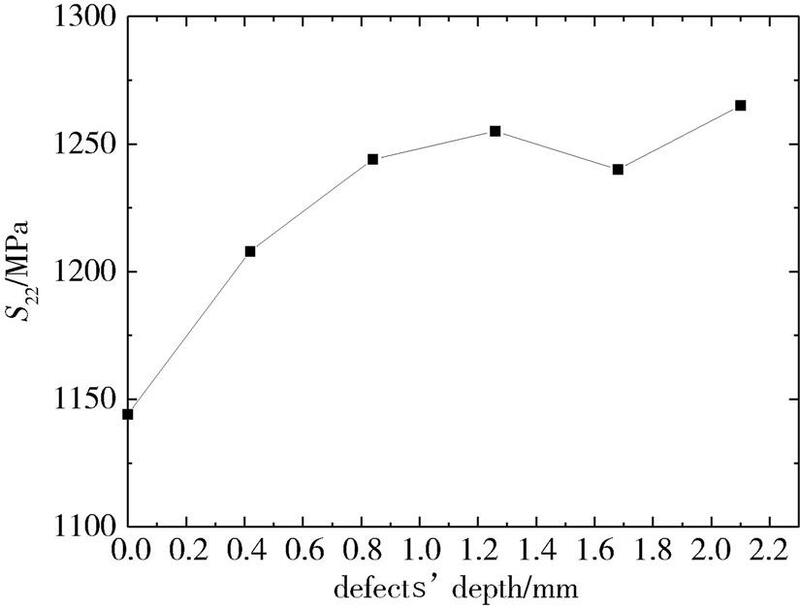 This research reveals that when the defect depth is greater than 1.26mm, the burst pressure decreases rapidly, and affects the normal use of the cylinder. 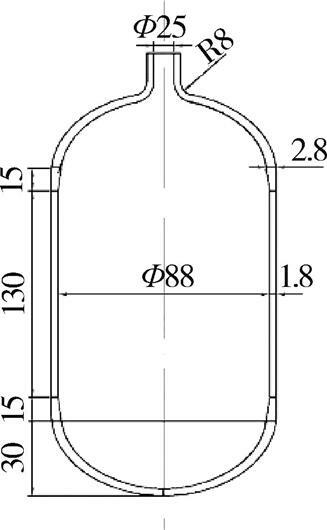 XU Y, LI Y, HUANG H. Investigation to the damage tolerance of composite cylinder for vehicles by numerical simulation[J]. Materials Science Forum, 2008, 575-578: 198-203. HUANG C H, LEE Y J. Experiments and simulation of the static contact crush of composite laminated plates[J]. Composite Structures, 2003, 61(3):265-270. HASHIN Z. Failure criteria for unidirectional fiber composites[J]. Journal of Applied Mechanics, 1980, 47(2):329-334. TSERPES K I, LABEAS G, PAPANIKOS P, et al. 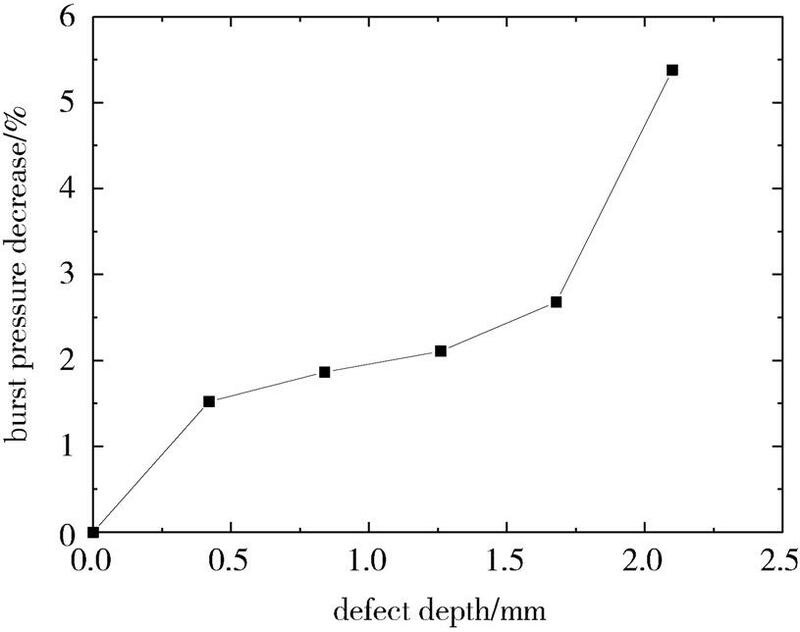 Strength prediction of bolted joints in graphite/epoxy composite laminates [J]. Composites Part B: Engineering, 2002, 33(7): 521-529. ZHANG X,ZHAO J P,WANG ZW.Burst pressure prediction and structure reliability analysis of composite overwrapped cylinder[J].Applied composite Materials, 2017,25(1):1-17. 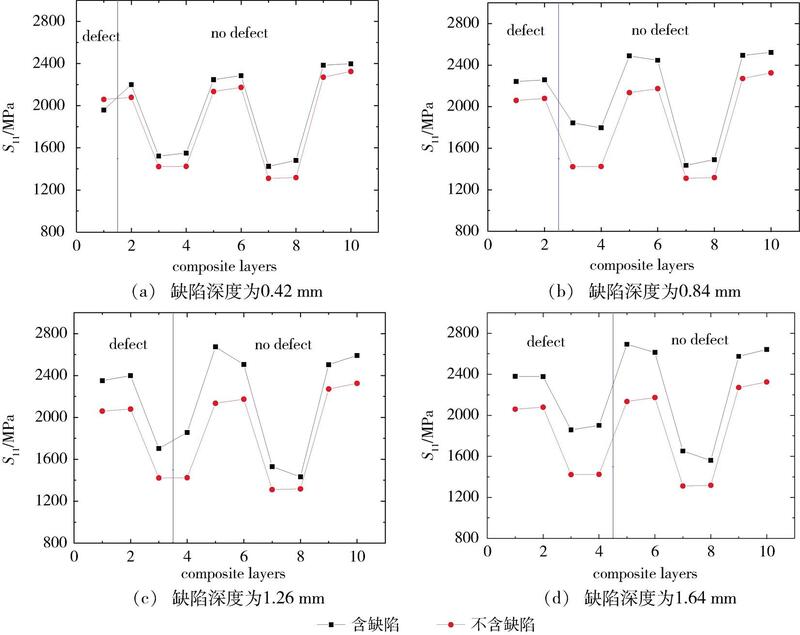 WANG Ziwen,ZHAO Jianping,ZHANG Xin.Prediction of Burst Pressure for Filament Wound Cylinders With Rectangular Defects[J].Aerospace Materials & Technology,2019,49(02):11-18.